Because you know I’m all about that beet, bout that beet, with pesto. 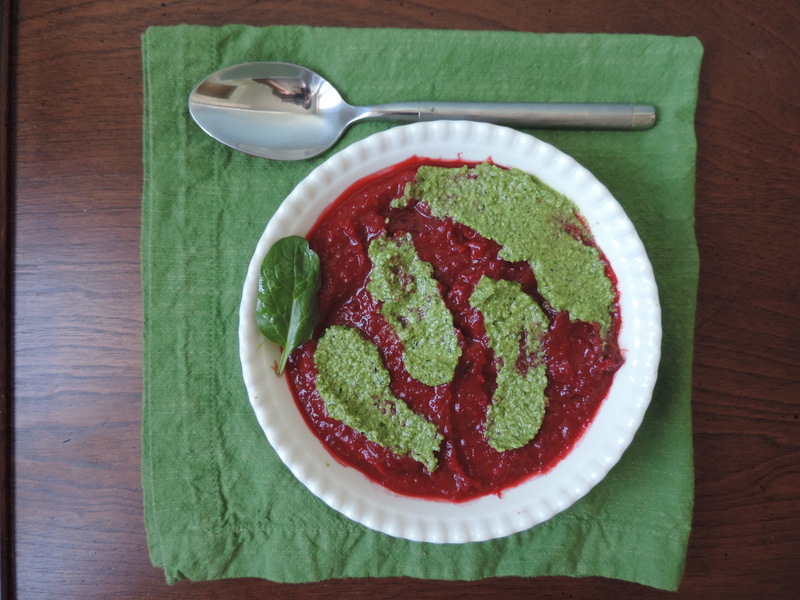 I’m all about that beet, bout that beet, with pesto. I’m all about that beet, bout that beet, with pesto. 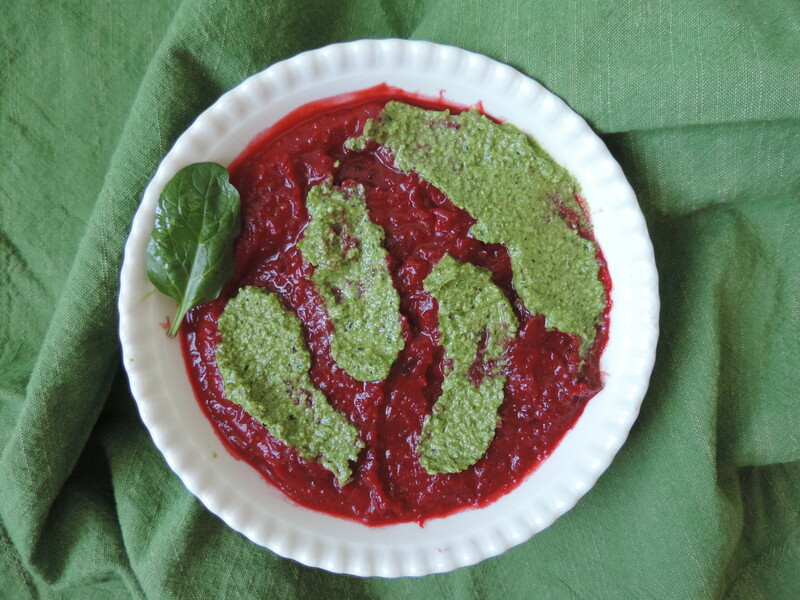 I’m all about that beet, bout that beet, with pesto. Hey! I’m bringing beet soup baaaaacccckkk! I could totally continue on with my Meghan Trainor/beet soup song, but I have an important recipe that needs sharing. For soup, no less. And while this soup is totally about the beets, it’s also about the butternut squash, coconut, curry and THE PESTO. [Vegan] Cilantro Lime Pesto that I posted yesterday. The combination of that pesto and this soup is money. Who calls a soup + pesto combination “money”? I called a sandwich “money” the other day while out to eat with the boy, who proceeded to tease me about using the phrase to describe food. I’m not generally a soup maker. I make big batches of chili all the time but for some reason I’ve neglected soup. I think it’s because, until now, I didn’t appreciate the beauty of soup. Soup is a fantastic way to use up ingredients — produce, proteins, etc. — that are on the verge of going bad. While soups can take a little longer to prepare, they yield a giant pot of deliciousness that can then feed you for days. Soups also let you play around with flavor combinations and can be relatively fool-proof. The curry-coconut-cilantro combo (with beets + butternut squash) is seriously delicious. The richness from the coconut is perfectly balanced by the acidity and freshness of the Cilantro Lime Pesto. And while I’m not a vegan, the vegan principle of using real, whole ingredients is one that I totally get behind. If you haven’t noticed, I don’t really do processed foods. This soup would be perfect to serve at parties, for the holidays or just make whenever you want a warming, delicious and satisfying meal. If you’re not a vegan, I suggest pairing this with a grilled chicken breast for some protein. Cut butternut squash in quarters. Cut the ends off (the little nub at the top and tough part at the bottom). Scoop out the seeds (save these for delicious roasted squash seeds if you feel inclined). Wash/scrub beets well. Cut off top and bottom of each beet, then cut into quarters. No need to peel the beets — just make sure you scrub them well. Lay butternut squash, cut side down, and beets on a sheet pan and roast for about an hour, until they are soft. Peel the skin of the butternut squash off (it should easily come off). Let the squash and beets cool slightly. When beets and squash slightly cooled, add to a food processor and pulse mixture until smooth. Add blended mixture to a large pot, along with coconut milk, water, curry powder, salt, pepper and optional chili powder. Heat over medium until mixture starts to boil, then turn heat to low and simmer for at least 30 minutes. Top each serving with a spoonful of cilantro pesto and serve warm. I’ve learned throughout the years that one can never have too much cheese. Cheese adds creaminess, gooiness and deliciousness — and also can elevate a dish and make it so much more satisfying. I should probably write a love song about cheese, but I’ll spare you for now. 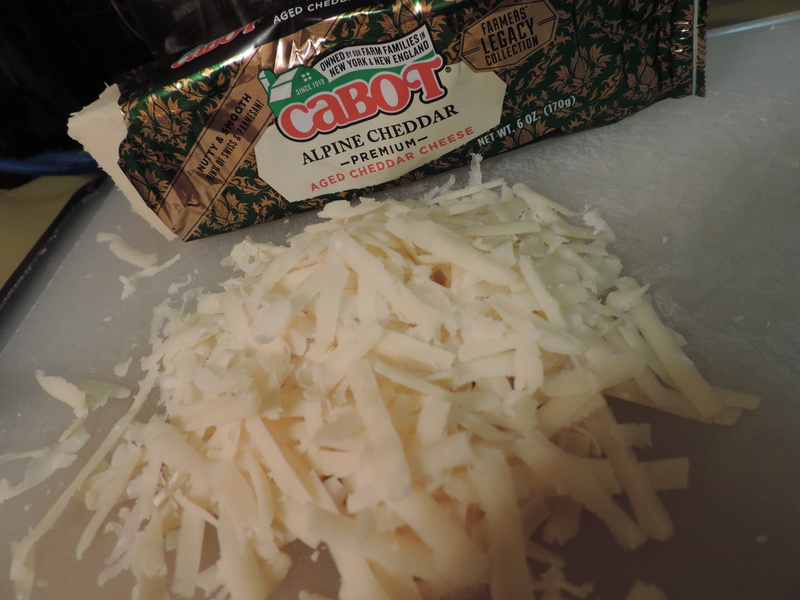 Cabot Cheeses are a personal favorite. Because their cheddars are aged, they are naturally lactose-free. More importantly, they give 100% of profits back to the 1,200 dairy farm families that make up their co-op. While browsing their website, I also came across the story of Barstow’s Longview Farm, who actually use their cows’ waste to create enough energy to power their farm AND churn Cabot butter. Awesome! Truly making lemonade out of lemons (aren’t you glad I went with that analogy over others?). When Cabot tasked us Recipe ReDuxers with creating healthier appetizers fit for Super Bowl and awards show parties — and provided us with LOTS and LOTS of cheese samples — I came up with an infinite list of recipe ideas. 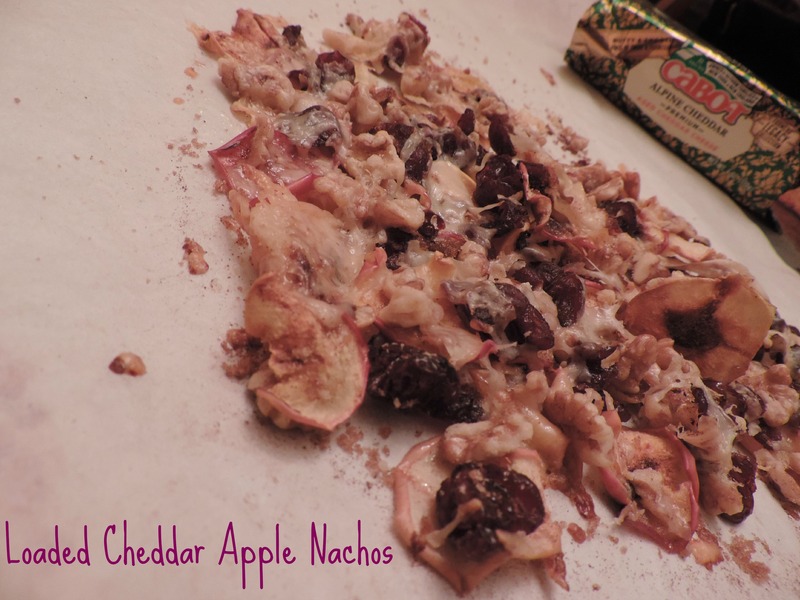 I love apples and cheese, so first I went sweet with my Loaded Apple Cheddar Nachos using Cabot’s Farmers’ Legacy Collection Alpine Cheddar. 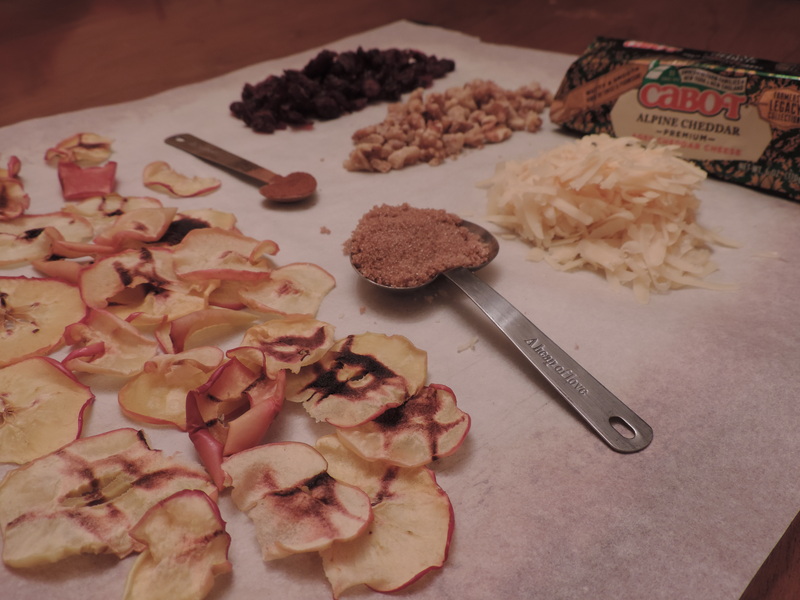 After making those, all I wanted to do was make more apple-cheddar recipes. Those nachos were seriously delicious. 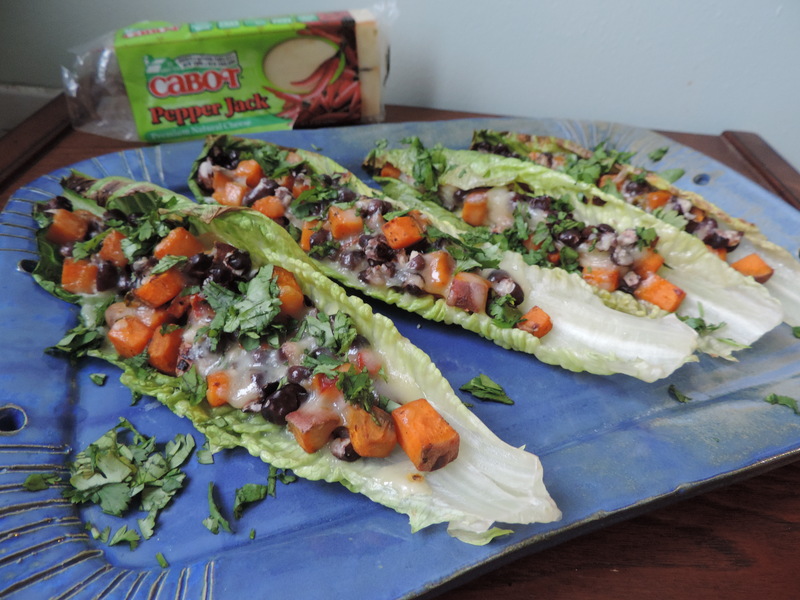 I was able to control that urge, however, and come up with an equally delicious savory appetizer that combines perfectly-spicy Cabot Pepper Jack cheese with sweet potatoes, black beans, red onions and cilantro to make a fresh and healthy side dish. 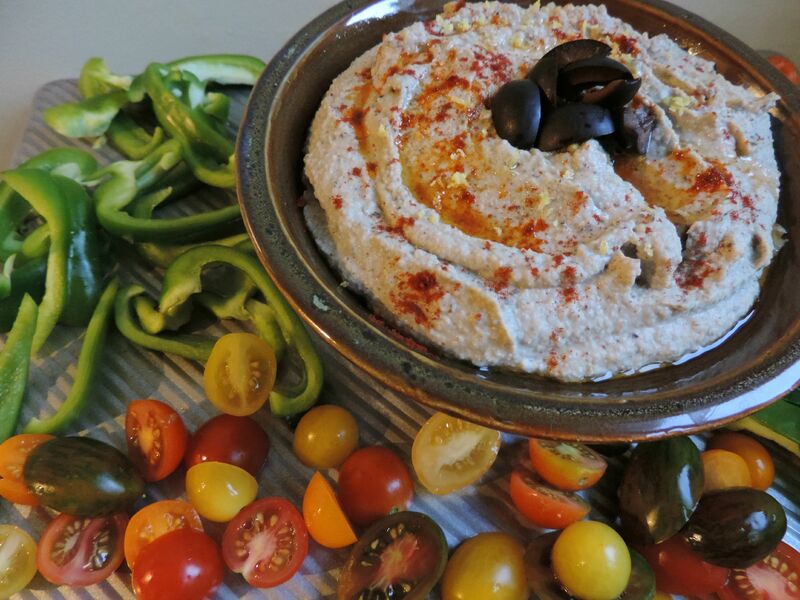 These are the perfect appetizer for game day parties or for a tasty snack. Add chicken or crumble tofu into the sweet potato and black bean mixture to create a full meal. If you like things extra spicy, chili powder would be a delicious addition. Heat olive oil in a large saute pan. Add red onion and cook for 3-5 minutes. Add diced sweet potatoes and cook until sweet potatoes are tender, about 15-20 minutes. Add in the black beans, cumin, paprika, salt and black pepper and cook for 1-2 minutes. 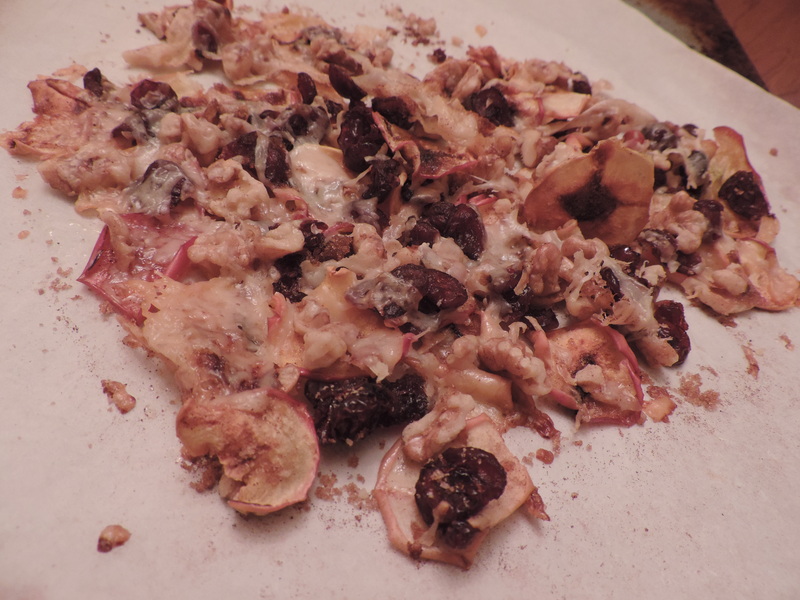 While mixture is cooking, turn oven onto broil. 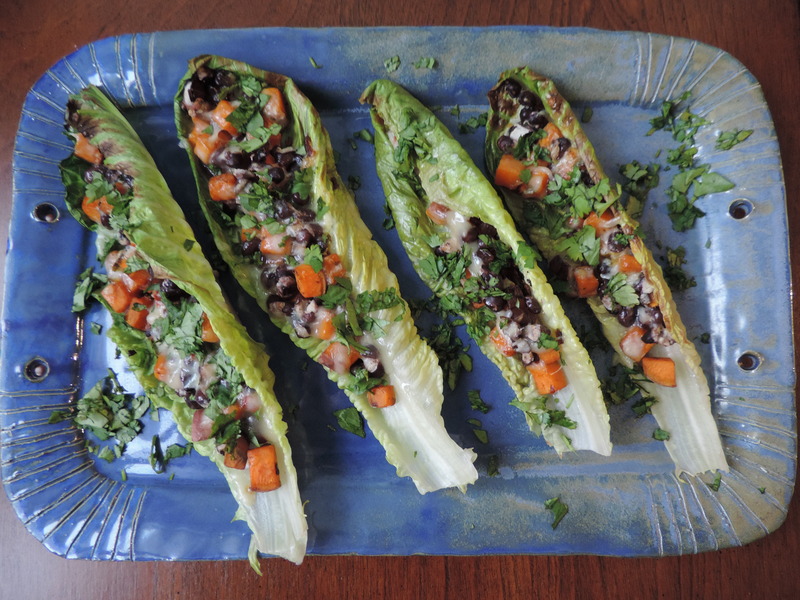 Lay romaine leaves on a baking sheet and spoon 2-3 Tbsp. of the sweet potato and black bean mixture into each leaf. Top evenly with shredded Cabot Pepper Jack (1/2 ounce per leaf). Broil for 1-3 minutes, until cheese is melted. 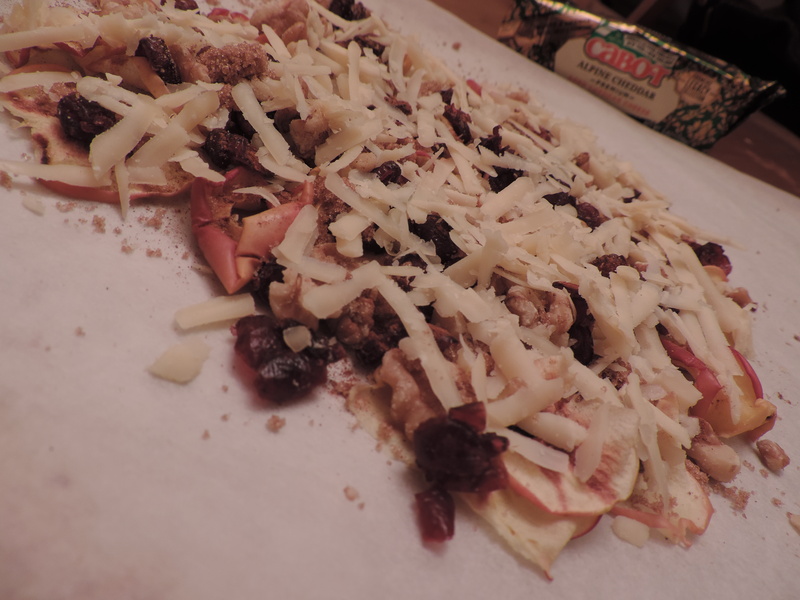 See what other delicious Cabot cheese creations Recipe ReDuxers have created by clicking on the link below! It’s almost Thanksgiving!! Have you figured out your Turkey Day menu yet? Holiday meny planning is a favorite activity, especially when done with my mom. Whether we’re physically together or discussing over the phone, we brainstorm back and forth to come up with the perfect menu. Needless to say, we’ve been plotting what to make for Thanksgiving for a couple weeks now. We wanted to make something to honor my Grandma Sona, who passed away over the summer. She was truly a very special lady and we all miss her more than words can say. My Grandma was the most amazing cook, even though she would tell you she really didn’t like cooking. While she’s made quite a few memorable dishes, my favorite was always Boreg. It’s an Armenian savory phyllo dough casserole similar to Spanikopita, but with the spinach subbed out for cheese and eggs. It’s seriously divine. 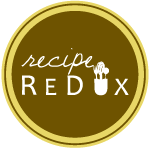 So when the folks at Recipe ReDux challenged us to share one of our favorite food memories and the healthier “redo” of the recipe, my decision was easy-peasy. I had made Boreg with my Grandma only one time, after convincing her to show me how. I quickly tried to jot down her recipe (or lack thereof) and eyeball how much cheese, milk, eggs, etc. she was using and managed to come up with a relatively straightforward recipe. We had a really great day cooking and hanging out together. And our Boreg was phenomenal, as always. She was very patient showing me how to handle the phyllo dough, brush the butter on, add the filling and bake it. I had never actually made it myself, though, let alone made a healthier version of it. Grandma’s recipe called for one cup each of Parmesan, Romano and Feta cheese and up to one stick of butter. I’m all for eating fats, but that’s a LOT of fat! To lighten it up a bit, I used low fat cottage cheese in place of some of the other cheese, cut down from one stick of butter to just 3 Tbsp., and used only about half of the package of phyllo dough, and I have to say that my version tasted almost as good — there’s no way I could ever beat Grandma’s — as G-Sona’s (our nickname for her). These Boreg bites would be a perfect side or appetizer for the holidays. 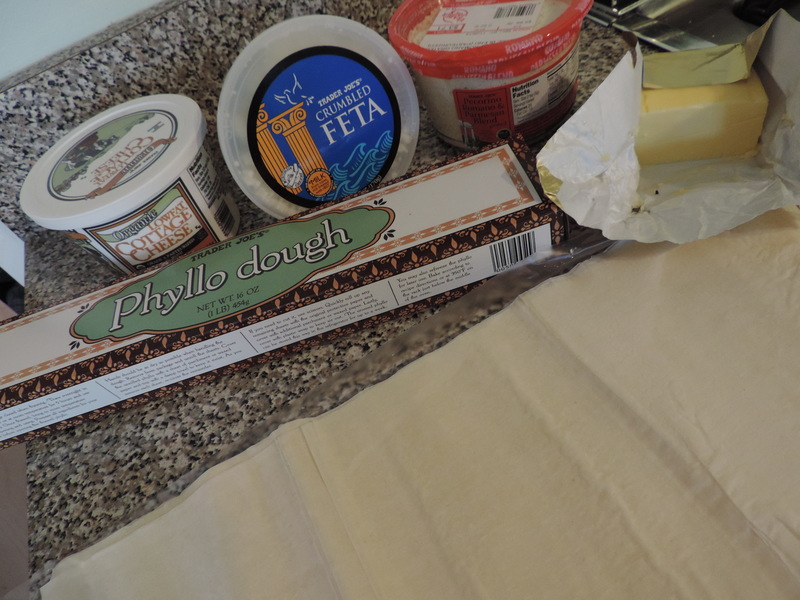 Try to work as quickly as possible when handling the phyllo dough as it dries out very fast. 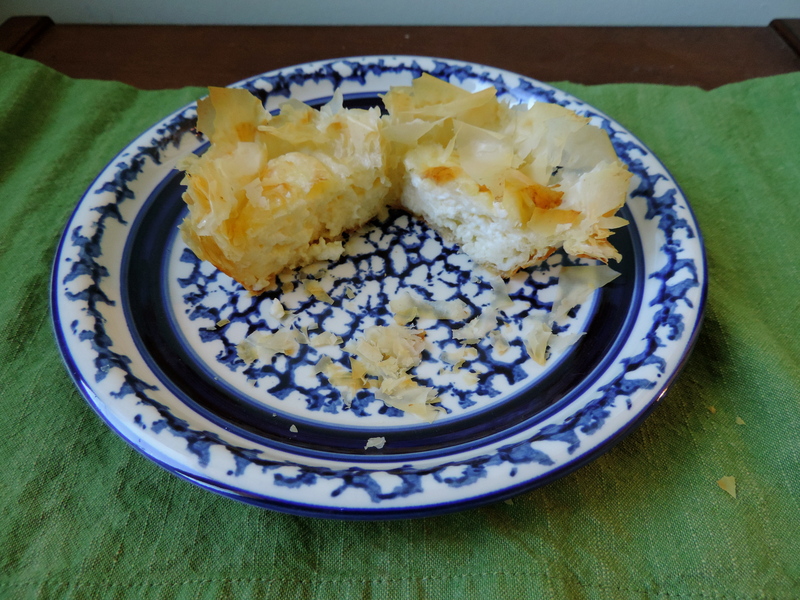 Don’t worry if the phyllo tears or gets crumbly — mine did and it turned out just fine. Preheat oven to 375. Grease a one-dozen muffin tin with butter or cooking spray. Lay phyllo dough out on cutting board and cut into squares of about two inches by two inches. 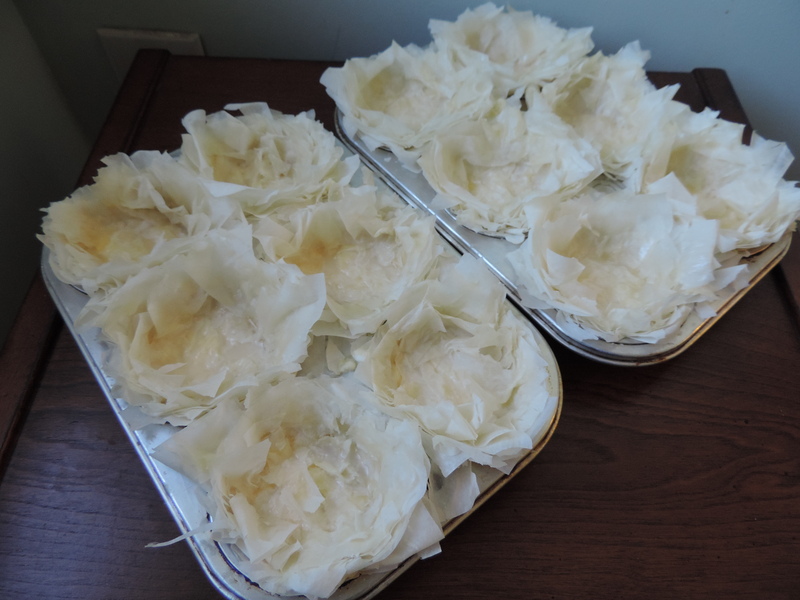 Lay 1-2 squares of phyllo dough in each of the muffin tin slots and gently press the phyllo into the slots. Brush the top layer with butter. Continue this process for 5-6 more layers. Mix 3 eggs, cottage cheese, Feta and Romano/Parmesan blend. 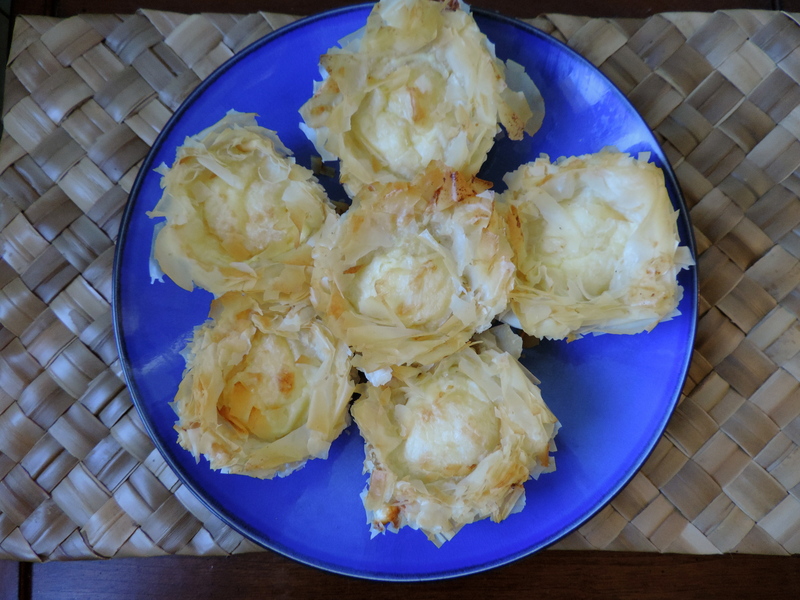 Place a dollop of the mixture in each of the phyllo cups. Continue to layer 5-6 more layers of phyllo/butter over the cheese and egg mixture. Combine remaining egg with baking powder and water. Beat with a fork. Poke holes through the phyllo cups with the fork and spoon about 1-2 tsp. of the egg/baking powder mixture into each cup. It will nestle into the fork holes you just made. 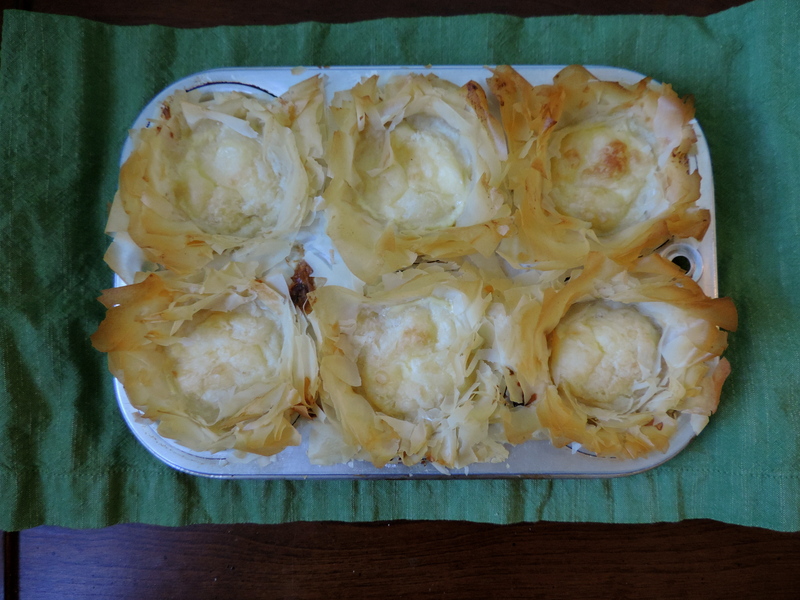 Bake for 25-30 minutes, or until phyllo cups are golden brown. This one’s for you, Grandma! I wish you were here to enjoy them and know you would be proud of my work. What family recipes will you be preparing this holiday season? See what memories inspired fellow Recipe ReDuxers by clicking the blue guy below.